The near total absence of women from the pre-talks on Yemen make one thing clear: we must no longer mistake the window dressing of technical advisory boards as actual women’s participation. The evidence has been clear for a long time – you cannot leave out the interests, influence and voices of half of society from peace processes by excluding women. We know that peace talks are more likely to succeed and peace agreements more likely to last if women are involved as active participants. That is why increasing women’s participation is not only the right thing to do, it is the intelligent thing to do. 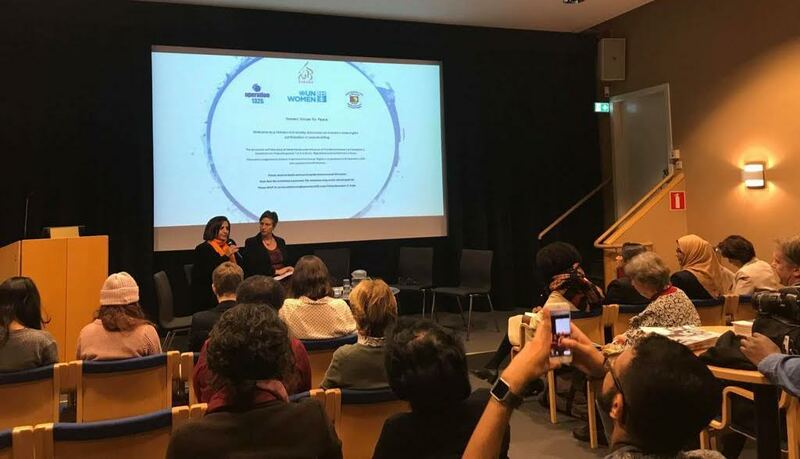 The global women’s movement has rehearsed these arguments again and again on the international stage, but when we see the pathetic number of women involved at the Stockholm talks on Yemen, it is clear our work is still not done. The use of women’s advisory boards as a means of giving women a platform and level of influence in peace processes is becoming something of a standard. But on the evidence of the processes for Syria and now Yemen, it is quite clear that they are not a serious and sustainable way of increasing women’s participation, or fulfilling global commitments to the women, peace and security agenda. Women’s advisory boards are now simply feeding a dangerous and damaging stereotype – that it is fine for women to simply advise from a distance, that they don’t need to be at the table. Women are not at these talks to serve as props in photo opportunities. Conflict has a devastating and disproportionate impact on women. It is vital that their perspectives are part of the discussions, and that they have a say in any agreement. Yemeni women have never been better prepared to participate in the decisions that affect them and their constituencies. We as NGOs and donors have been investing in the skills and capabilities of women. While the men at the peace talks have been focusing on the failed military solutions that have led to the worst man-made humanitarian crisis on Earth, Yemeni women have been strategizing about the peace their country needs. They have been working on what a just and lasting peace might look like. Yemeni women’s civil society is more serious and better able to build peace than anyone currently at the table. Why are they not there? Yemenis have already involved themselves in a serious and comprehensive program to discuss how their country should be governed – the National Dialogue. That process recommended a minimum quota for women’s participation of 30 percent. Why has the international community not held the parties at Stockholm to their own agreed quota? The Secretary-General has made much of his achievement of gender parity at the top levels of the United Nations. We need that same sense of urgency brought to Yemen and all other UN-led diplomatic processes. We need a strong UN Women to make that case loudly at every opportunity. When the full talks on Yemen start in January, we will expect proper representation of women, and for the women’s agenda to be on the table. We do not underestimate the effort that has gone in to bringing the warring parties in Yemen to the negotiating table. It is not too much to ask then that these talks are properly inclusive. Peace processes that do not properly represent the communities involved will not deliver peace. It is as simple as that. Will Mr Guterres, the UN, and the international community be prepared to make the UNSCR 1325 and the women, peace and security agenda a reality? The eyes of women across the world are on you.